How Do Coastal Marshes Respond to Climate Change? This week at AGU, you are giving a NASA hyperwall presentation about your Louisiana Coastal Marsh research. Why is it important to understand how coastal marshes respond to climate change? 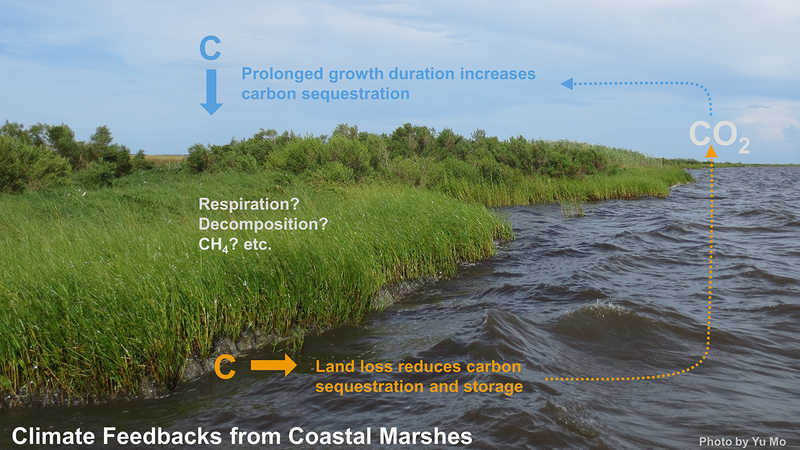 Coastal marshes are important carbon sinks, owing to their high carbon burial rate and low organic-matter-decomposition rate. Coastal marsh ecosystems, however, are under increasing threats under to the growing coastal populations and the rising sea-levels. Understanding how coastal marshes respond to climate change allows us to develop better carbon management strategies to protect the ecosystems under the current climate and to promote their ecosystem services for climate mitigation and adoption. What role has Landsat played in your research? The study is made possible by the Landsat data. The long-term record of the Landsat data (i.e. over 30 years for TM, ETM+, and OLI) enables the study of the impacts of climate change on ecosystems worldwide, in our case, coastal marshes. The high spatial resolution of the data (i.e. 30 m) allows our results to better represent the highly heterogeneous coastal environments. You have made your Louisiana coastal march phenology data available on the Gulf of Mexico Research Initiative Information & Data Cooperative website. What is the GRIIDC? And how are data users using your phenology data? The Gulf of Mexico Research Initiative Information and Data Cooperative (GRIIDC) is a forum for both storing and sharing scientific data generated by Gulf of Mexico researchers. This system is developed to make the results of our scientific research available to the public, as well as to promote continual scientific discovery and public awareness of the Gulf of Mexico ecosystem. The phenology data generated from my study provide extensive information on vegetation conditions of Louisiana coastal marshes, which can be applied to study other marsh-related issues such as shoreline erosion and habitat degradation. Therefore, the data can be used by a wide range of research communities, including carbon science, wildlife ecology, and coastal engineering, which are beneficial for coastal marsh management with a broad scope, including storm protection, fisheries management, water purification, biodiversity conservation, and climate mitigation.